Merida mayor proclaims success of Green Infrastructure Plan. MERIDA — Mayor Mauricio Vila announced that this year, through the Green Infrastructure Plan, his administration will exceed the planned goal of planting 60,000 trees in Merida, an action that will allow the Yucatán capital to have a coverage of 7 square meters green area per inhabitant, above the average in Latin America that is 3.6 square meters per inhabitant. When the inauguration of the Forest Crusade 2017 as part of this plan in the colony San Antonio Kaua, the mayor explained that in just 1 year and 2 months, since the announcement of the creation of the Green Infrastructure Plan in April 2016, more than 54,000 trees were planted in the city. 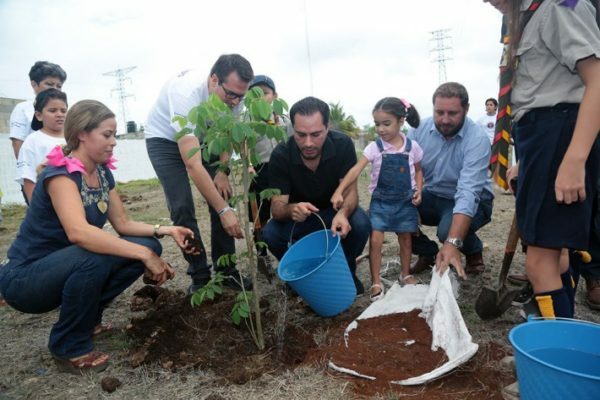 In this program 8,000 more trees will be planted and another 2,000 will be donated, so that the original goal of planting 60,000 trees will be exceeded, which will increase the forest cover of Mérida over the three years of his administration. He pointed out that the World Health Organization says that cities should have 9 square meters of green area per inhabitant. However, with the support of civil society and private initiative this goal will soon become a reality if joint efforts to reduce the effects of Climate Change in Merida. José Alfageme, regional manager of Grupo Modelo (the most important beer company of Mexico), thanked the opportunity to join the municipal initiative and remarked the importance of planting more trees to mitigate the effects of heat and care for the environment. Before representatives of Grupo Modelo, specialists and civil associations that promote sustainable development, Mayor Vila emphasized that the increase in the quantity of trees through the Green Infrastructure Plan is only one of the aspects to reverse the effect of high temperatures in Merida. In addition to this plan, Merida City Council obtained international funding to carry out the inventory of greenhouse gases, being the only city together with Guadalajara to obtain support from the World Institute Resources to know the causes of these emissions and their impact on climate change. He explained that in Merida 69% of greenhouse gases are due to vehicles and 19% to buildings by the type of energy they consume, such as air conditioners. The Mayor recognized the collaboration of the civil organizations, with groups such as Sons of Mother Earth, Kanan Kab, Scout Province Yucatan, Greener Association, Hunab Life Project, Dunosusa and Oxxo. Vila Dosal also thanked the participation in the beginning of the Forest Crusade of the Children and Youth Symphony Orchestra Renacer, which enlivened the event, as well as the parents and the 80 children and youngsters who are part of it and who participated with the planting of trees.